This close date variety is somewhat more common than the variety at HBCC-3162. The reverse has a wide space between the D in 5D and the following period. Walter Breen described this variety as Rarity-7 in his half eagle monograph published in 1966. It is possible that as many as 15 to 20 examples survive today. The Bass Collection coin is a lovely Mint-State example, and clearly qualifies as one of the finest known. Purchased from Rowe and Brownlee, October 6, 1966. 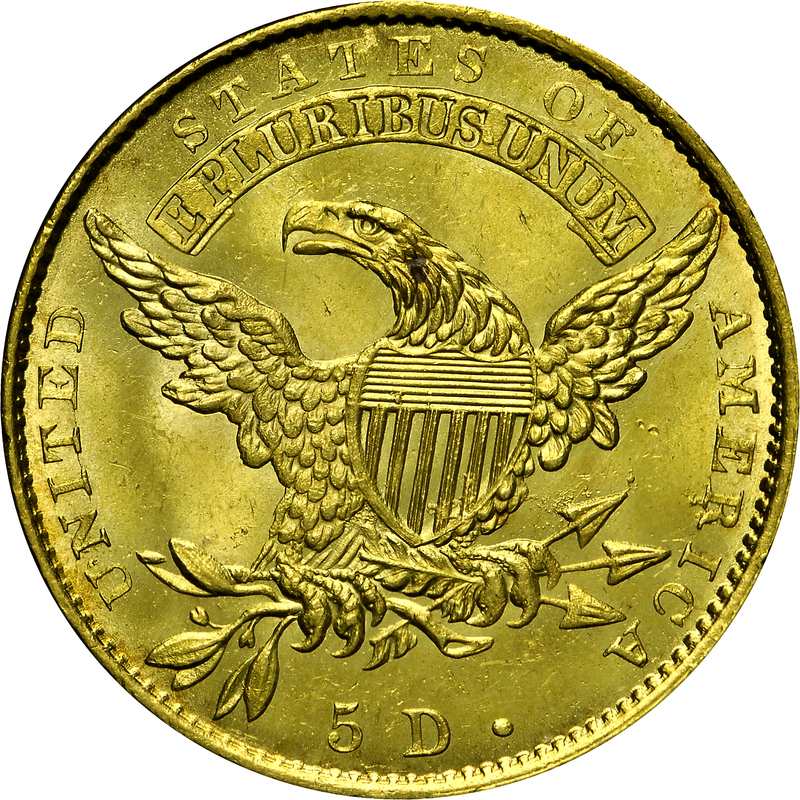 "Obverse: Closely spaced date. Small stars. Short normal 1, its top barely above that of 8. Belted 8. Different punch for 3s, its center point being normal. Other than for the 1, these punches are of the same height as those used for Obverse 1. Star 1 only its own diameter away from bust. Lowest hair curl is short and open in its center - possibly due to lapping, but more likely as a result of the Head device having been shallowly sunk into the die stock. 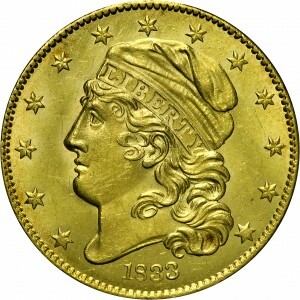 Reverse: That of 1832A. Small 5 and D - top of 5 concave. Oblate period quite distant. Rear talon beneath top leaves pair now but a speck. Die center punch lump in shield. I beneath T. Arrow tip beneath I. Cracks thru NITED, AMER. Rust lumps in field; above top leaves pair, around top arrowhead, (U)N, (I)R, and within lower shield. Lapping continues. 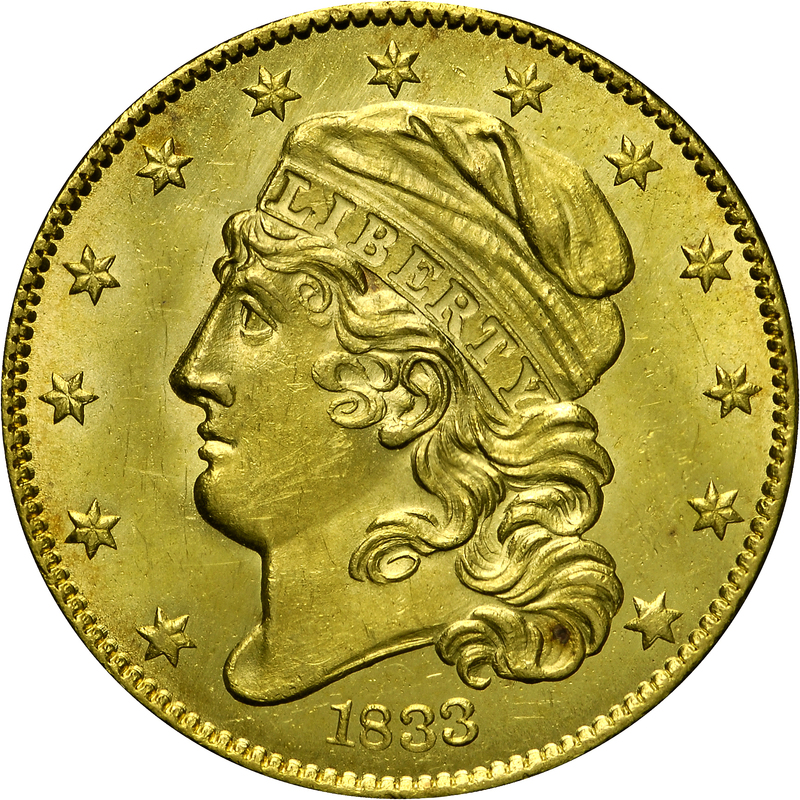 The transformation of this reverse die from its state (a) to state (e) is astonishing."